With their eight long legs, beady eyes, and their tendencies to spin webs just above eye level, few creatures inspire fear in humans quite like the spider. However, in the vast majority of cases spiders are harmless to humans unless disturbed or threatened. One of the best ways to combat an anxiety about spiders is to learn about the specific arachnid species you're likely to encounter in your region and around your home. In the New England region of the United States, the most common species of spider fall into a few families: crab spiders, grass spiders, jumping spiders, nursery web spiders, orb weavers and wolf spiders. These New England spiders are generally of common house spider size, growing no larger than an inch and a half large (three inches long with legs outstretched). These spiders, which are among the most common spiders found in Massachusetts, have a characteristic crab-like body shape and may even walk sideways or backwards like crabs. Since they do not build webs, crab spiders hide and wait for their prey. The best places to find these spiders are open areas such as on fences or plants. Common crab spiders in New England include the white banded crab spider (Misumenoides formosipes) and goldenrod crab spider (Misumena vatia), which can change its body color to match the flowers it hides on. Grass spiders, also called funnel weavers, build funnel-shaped webs on the ground, usually under debris or rocks. Their body color varies, but they usually sport two wide stripes down their bodies. Common grass spiders in New England include Agelenopsis kastoni, Agelenopsis potteri and Agelenopsis utahana. Named for their propensity to jump on prey or when startled, this large family of spiders varies a great deal in coloration, distribution and size. Common jumping spiders in New England include the bold jumper (Phidippus audax), tan jumping spider (Platycryptus undatus) and zebra jumper (Salticus scenicus). These spiders are named for their reproductive habits. Mother spiders carry their egg sacs using their mouth parts and then attach the sac to a plant and build a nursery web around them to protect the emerging spiderlings. Common nursery web spiders in Massachusetts and other parts of New England include the dark fishing spider (Dolomedes tenebrosus), nursery web spider (Pisaurina mira) and six-spotted fishing spider (Dolomedes triton). 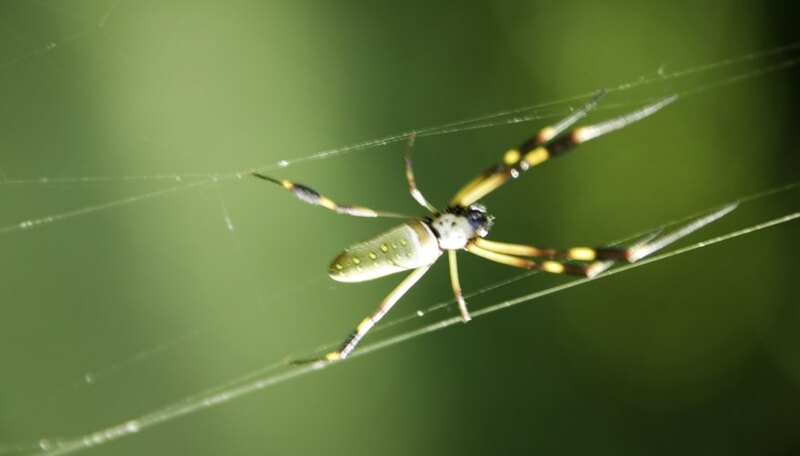 Orb weavers are best known for their elaborate webs and date back to the early cretaceous period. While certainly not common among orb spiders in New England, some extremely large species of orb weavers even eat bats. Species found in New England include the bridge orb weaver (Larinioides sclopetarius), cross orb weaver (Araneus diadematus), furrow orb weaver (Larinioides cornutus), Hentz orb weaver (Ne_oscona crucifera_), marbled orb weaver (Araneus marmoreus), orchard orb weaver (Leucauge venusta) and six-spotted orb weaver (Araniella displicata). This large family of spiders derives its common name from the tendency to chase and pounce on prey. Wolf spiders are generally dark in color and recognizable by their unique eye arrangement: one row of four small eyes under two rows containing two eyes each. Mother wolf spiders drag their egg sacs with them and then allow their offspring to ride on their backs after hatching. Common wolf spiders in New Hampshire and other parts of New England include Hogna baltimoriana and Gladicosa gulosa. 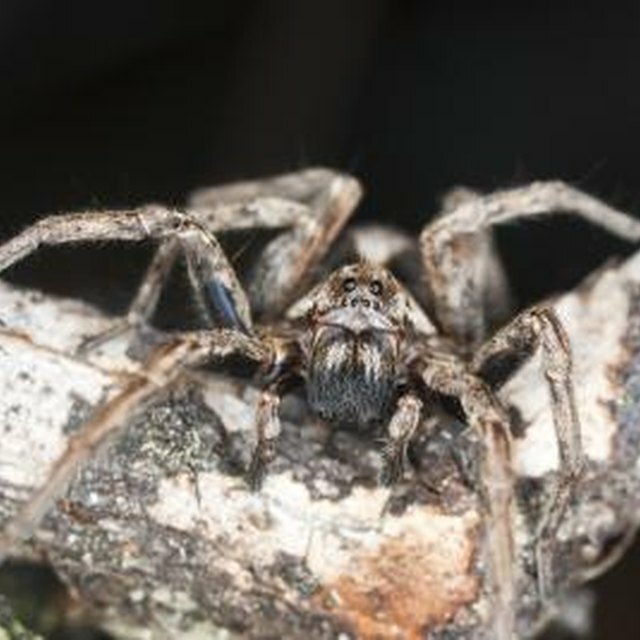 Though these are one of the more visually concerning spiders in NH, wolf spiders tend to only approach human homes in the autumn months, when the region gets colder. Many people wonder about poisonous spiders in Connecticut and other parts of New England, especially the notorious black widow. While species of black widow do inhabit New England – notably the northern black widow (Latrodectus variolus) – stumbling upon a black widow is not very likely and not something to fear. Mayer, Melissa. "Common Spiders in New England." Sciencing, https://sciencing.com/common-spiders-new-england-6572022.html. 25 October 2018.